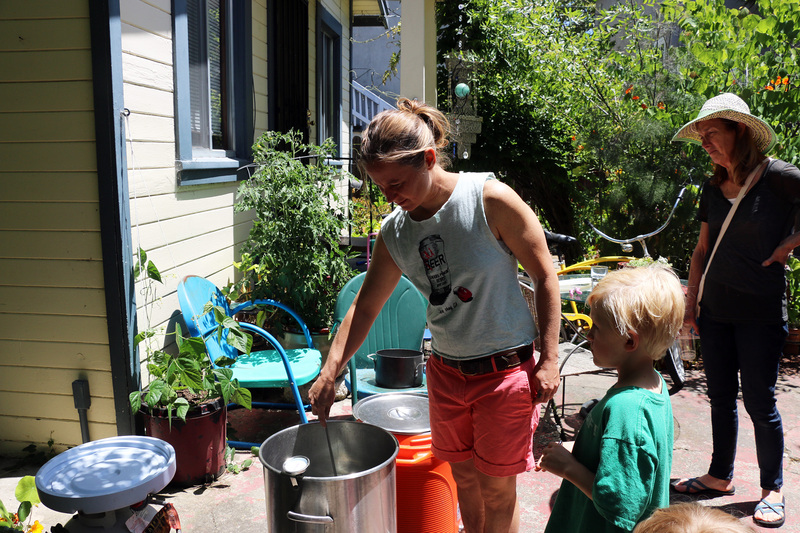 Two years ago, Rebecca Sandidge, a Ph.D. student in Entomology at UC Berkeley and a longtime surfer, attended a homebrewers meetup in San Francisco, but only one other person showed up. Engineer Kate Summerhill happened, like Rebecca, to be a Bay Area transplant from Florida, as well as queer. They hit it off and, soon thereafter, Queers Makin’ Beers (QMB) was born in Sandidge’s Oakland backyard. 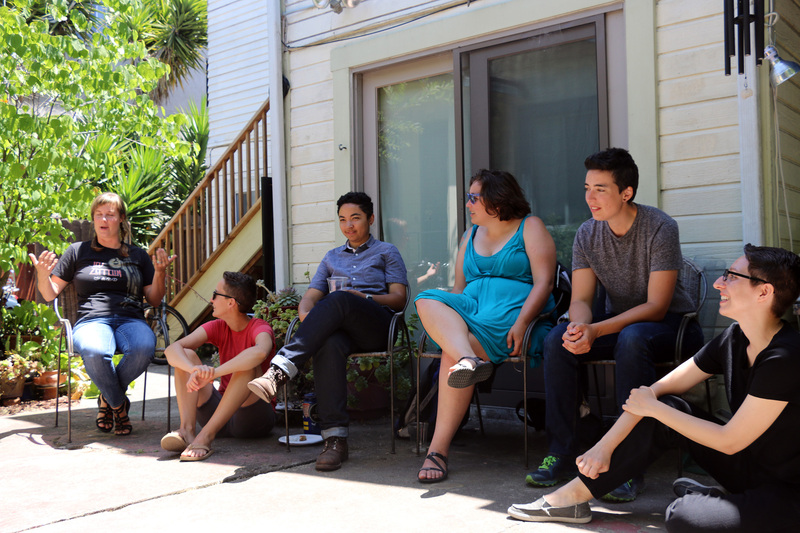 The group now has more than 500 members across the Bay Area. 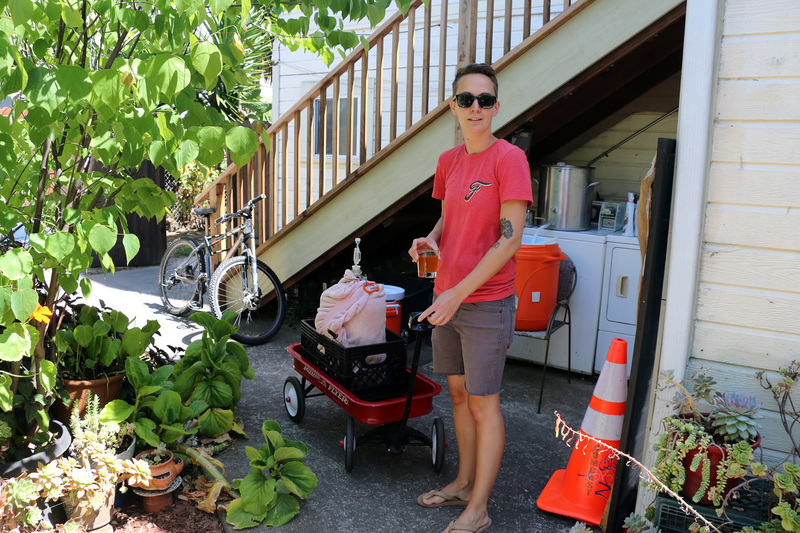 While there are many events scheduled throughout the year, QMB’s main focus is on brew days, which are open to everyone who is queer-identified. Most of the core group members are women, and Sandidge muses that perhaps this is because it’s more of an educational gathering than a bar scene—these are science geeks experimenting with everything from IPAs to milk stouts, with a seriousness deeper than the average consumer of beer. That’s not to say the meetups aren’t social. In fact, there’s a lot of time to shoot the breeze while the six- to seven-hour process of brewing unfolds. I attended a recent weekend brew, along with my wife and kids, and hung out with about 10 other brewers, ranging from very experienced to total newbie. The atmosphere was super-casual and welcoming, but with a connoisseur’s eye toward the craft of brewing. And there was beer, of course, in this case, a lager that hadn’t yet been lagered, or aged. This was the first time I’d encountered the word “lager” as a verb, and Sandidge explained that it means “to store” in German, but is now commonly applied to beer as a noun. The typical sequence on brew days is that Sandidge, Summerhill and other experienced brewers start setting up early, first by boiling a big vat of water into which the grist (a mixture of malt and various grains) is poured to start the mash conversion. The enzymes in the malt convert the starches to sugars over a period of 45 minutes to an hour, then the liquid is poured off and brought to a controlled boil, at which time hops are added. 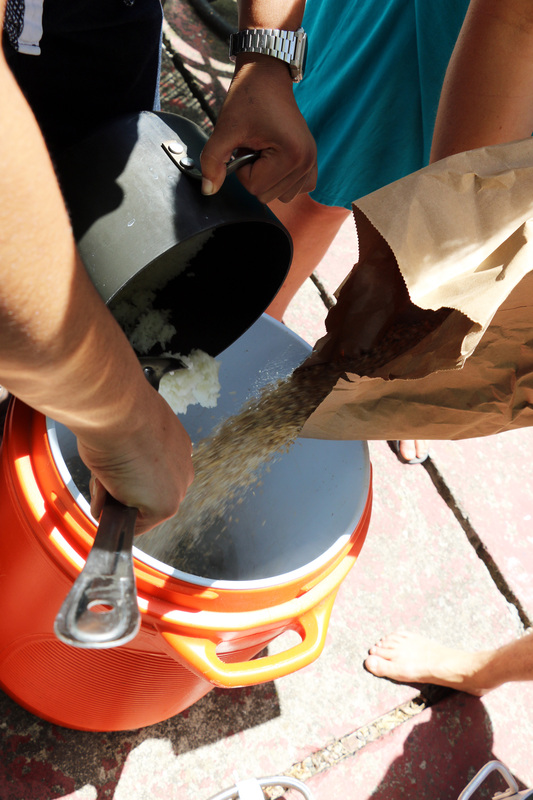 Fermentation is the next step, in which any remaining particles are removed and yeast is added. 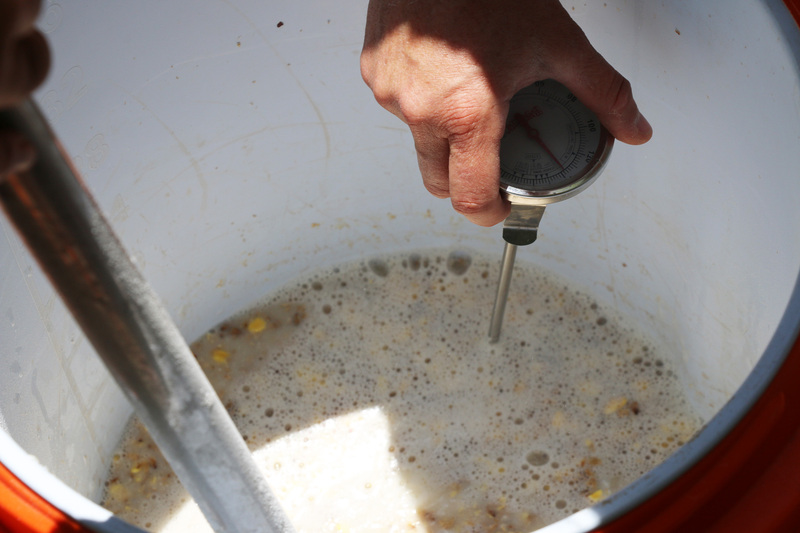 Yeast converts the sugar into alcohol and, depending on the type of recipe, the beer then matures from one to six weeks. Most brewers combine the primary fermentation with a second fermentation after bottling, again, depending on the style of beer desired. Lighter beers typically require a shorter fermentation process, while darker beers take more time to develop. The final step is to filter and carbonate the beer, and then rest it for as long as you like. During this whole meandering process, people come and go. 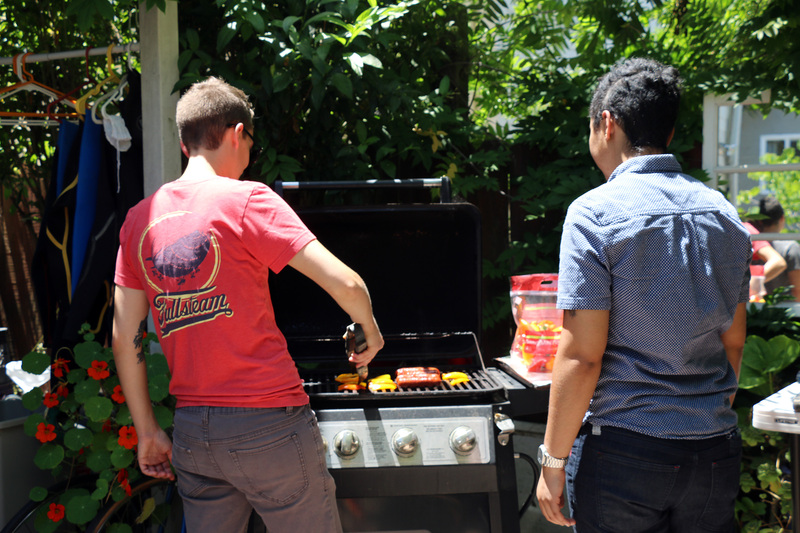 At the last brew, Summerhill managed the grill—hot dogs (with a veggie option) and grilled peppers—and Sandidge set up a table with logo merchandise, including glassware and t-shirts she designs and prints herself, as well as a donation jar and a raffle for a homebrewing kit. “Why beer?” is clear, but why queer? The mission is straightforward: to address the need for experiential, educational spaces free of racism, misogyny, sexism, homophobia, transphobia, ableism, xenophobia, and judgment. It’s designed for the queer-identified, but anyone who rejects the prevalence of heteronormativity is welcome. As Sandidge adds, “Making good beer is a radical and empowering act,” so it stands to reason that one of the outcomes of this group is to empower the marginalized and create space in which this community can flourish. Queers Makin’ Beers is trying to grow its reach by offering support to new chapters, as well as continue its work in brewing education. QMB’s fundraising campaign is trending now on GoFundMe, and they’d like to raise $15k by the end of June, which, perhaps not coincidentally, is LGBTQ Pride Month. So, raise a pint glass to these queer-beer-pioneers, and celebrate the diversity in our community.